Today I slept almost the whole day. Guess I wasn't feeling as well as I thought. I woke up around 6 pm and worked on the last of the Altrusa ornaments. 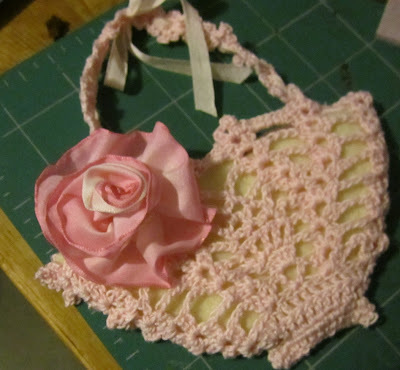 The pink crocheted basket is finished and it has a pink ribbon rose on it. 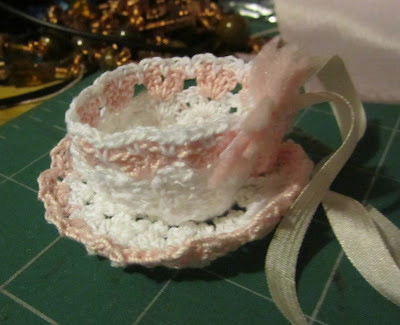 The pink crocheted tea cup only needs to be starched a bit and it will be done also. My friend has invited me to see the tree at the Elks club on Saturday. She got a dressmakers mannequin as one of the gifts so everything is coming together! I have only one more thing to find, a pearl necklace I made for another gift. This tree is going to be a Victorian dressmakers dream! Rosary Finished, Now What to do?